Crunchy Gingerbread Bites (Pfeffernusse) are bite-sized cookies with a European heritage. They stay fresh for days and don’t crumble–perfect for gift-giving. These cookies won the Star-Telegram Christmas cookie contest awhile back–I think. Or maybe it was second place. I’m not sure. Anyway, I printed the details and stuck it in my someday-I-want-to-try-this file. When I heard our church needed cookies for the Christmas baskets we give to the older and less mobile members, I dug out this recipe. It was the perfect opportunity to experiment because I would have something to do with them besides stuff my own face. They stay fresh and delicious up to 3 weeks or can be frozen. By the way, I made up the name “Crunchy Gingerbread Bites” because who can pronounce their real name unless you speak German? I won’t even try to explain the translation, pepper nuts, but you can read about it on Wikipedia. These miniature sweets are some trouble, officially qualifying them as Christmas cookies. I’ve figured out if you want to be labeled a Christmas cookie, you must be either red, green, or labor-intensive. Now I’m not saying these cookies are difficult to make. They couldn’t be easier. It just takes a chunk of time to cut all those little pieces of dough. Don’t worry, the last tray only took about a third of the time of the first tray. Roll a piece of dough about the size of a pencil. Cut in 1/4 to 1/2-inch pieces. Originally, I thought I would roll each little ball by hand. HA! There must be about a thousand per batch. People eat them by the handfuls, so trying to make them look perfect is wasted energy. Space far enough apart so you don’t end up with any Siamese twins like I did. To package them, I put about 3/4 cup in each cellophane bag (available at craft stores) and tied each package with red raffia. A cute Christmas label would have been nice. (Sigh) Maybe next year. Crispy bite-size cookies reminiscent of gingerbread. Also known as Pfeffernusse. Whip room-temperature butter until light and fluffy. Add sugar and egg and continue to beat. 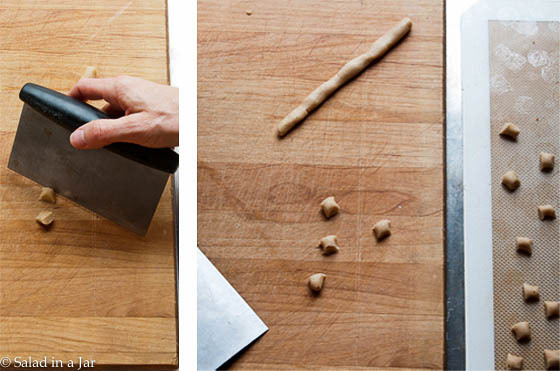 Pull off small pieces of dough and roll to the thickness of a pencil. Slice into 1/4-1/2 inch pieces. 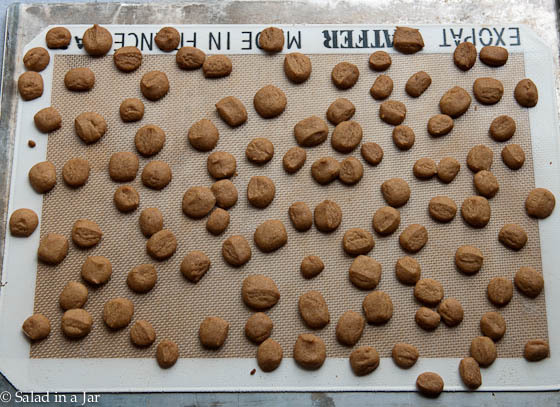 Place on a cookie sheet covered with a silicone mat or parchment paper. Bake at 350 degrees for 7-9 minutes or until bottoms begin to brown. Dumb question but when you say soda you mean baking soda right? i made these one time last year and loved them so i decided to make them again but this time my dough is very crumbly i cant get it to stay together so i can roll them. what did i do wrong this time and how can i fix it. please help. Since I didn’t watch you make them last year or this year, I’m at a loss as to what you did wrong. Perhaps you measured wrong? or left something out? Sorry I can’t be more helpful. My grandmother gave a similar recipe to my mother many many years ago. My mother has been making them for many years now, as long as I’ve been live I think(43) On thanksgiving we have a rolling party and they get done very quickly. It’s a great family fun time. And I charish it every year. Eating them slow so they will last most of the winter. They are delishious and crunchy. Love them!! By the way, they stay fresh a lot longer then three weeks, and still taste good. ;)? I love the idea of a “rolling party”. What fun! Thanks for sharing. Thanks for sharing this recipe. My Grandma always made them and used a thimble to cut them out. Since they have anise, they were really never a favorite of mine, but I have great memories associated with them. Thank you Paula. I love your blog! Thanks Rhonda. Appreciate you stopping by. In Holland we eat millions of these at Saint Nicolas on the fifth of December (and in the months leading up to it). Most of them are shop bought. Only the really lucky kids get home made ones likes these (and have fun helping their mums make them). This was a family recipe and they are all kinds of yummy. They go great with a cup of coffee or hot chocolate. I made the recipe to a T, however, rolling the dough out was not a option as it kept crumbling. I had to form a “rope” with my fingers and then cut so they were more squarish. What did I do wrong? They did come out fantastic nontheless! What could I have added to soften it up without changing the final product? Thanks! Sherry, I do not roll mine out either. Just squish the dough together with your hands and roll into pencil shapes with your fingers just like you did. I do not roll out cookie dough–any cookie dough, unless it’s inside a ziplock bag. Just not my thing. Glad they turned out tasty. If going with the rolled pencil approach try putting the rolls in the freezer, (or out on the porch if you live in Canada as I do where the outdoors is one big freezer for 5 months of the year) prior to cutting them. It will help hold the shape of the little cookies and make them easier to handle. Shelly, Great suggestion about putting the dough “pencils” in the freezer. Seems like it would be easier although it’s not too difficult without doing that. I love reading the comment section before trying a recipe to make sure I don’t mess up and just because sometimes comments are entertaining! I’m in SW Ontario and from December until late February our porch is the fridge/freezer too! Thank you for the recipe Paula! I like your name for the it, but I think I’ll stick with Pfeffernusse! I’m not German. It just makes me smile! My husband’s Mennonite family has made this traditional Christmas cookie for years and for the twenty years we’ve been married I’ve made them annually. Some times I’ve rolled the dough flat and used a tiny cutter I received at kitchen product party making little flower and stars. Recently I saw a recipe on-line that suggested your roll the dough out to 1/4 inch thick on a cookie sheet, score it in small squares and bake it, breaking apart the cookies once cool. I may try this method this year along with a batch of the traditional ones. I find the flavor reminiscent of chai tea. yummy! Love this recipe! I signed up for a baked goods swap and still had not decided what to mail out. this will be perfect and still have some for the kids at home! I just like to say Pfeffernusse…. must be the German in me. How fun Paula! These look wonderful – I love almost anything German and Pfeffernusse is not exception – oh, and I do speak German but I love your new name! These really are adorable little cookies… almost look like they are made for dolls!!!! Now I am curious about what recipe you submitted to the contest! Hey Derinda, It was these cookies: Soft Cinnamon Cookies with Browned Butter Icing. Grandma Herd made them a LOT. at to take to the office “do” next week.